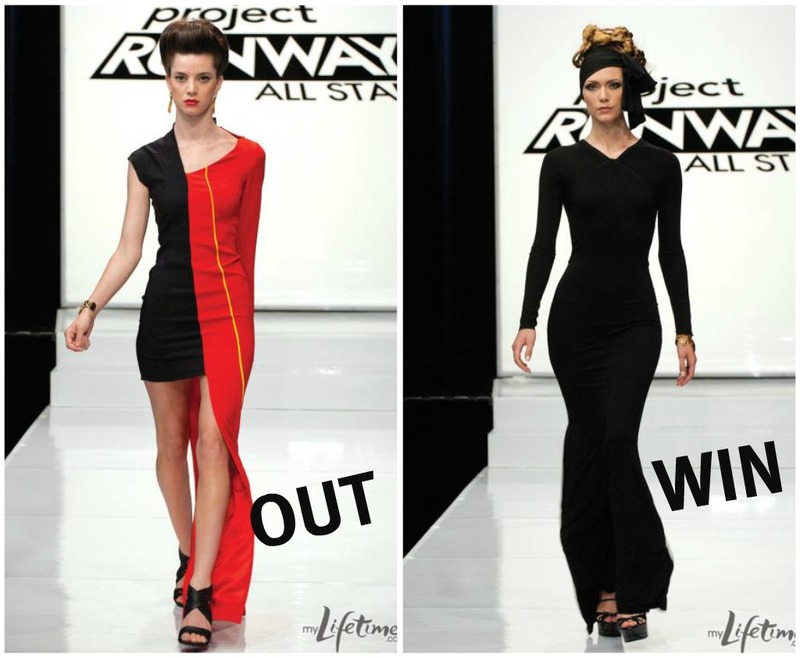 So I am back with some thoughts and such on Project Runway All Stars and it's happenings. I missed last week's post because my Thursday night was very hairy, as was my Friday... I didn't even end up watching Episode 7 until Sunday at some point. Anyway, that episode made me sad, as we bid farewell to my lady Kara Janxy poo. According to the judges, she just wasn't the caliber of designer that the rest were, or something like that. She was extremely disappointed and frankly, she just seemed exhausted. My poor pumpkin. I love her designs dating back to that wrap dress from her season. So Episode 8 brings our remaining designers (Austin, Mondo, Mila, Jerrel, Michael, and Kenley) to the United Nations, where each designer will create a look based on a country's flag and indigenous culture. Mondo won last week so he gets first choice, Jamaica... Michael chooses Greece (because as he tells us multiple times in the episode that he is Greek afterall), Mila chooses Papua New Guinea, Jerrel gets India, Austin has the Seychelles and Kenley is left with Chile. This episode, I really hone in on my distaste for Mila. She is a wretched creature. She has made comments for the past 4 episodes about how she doesn't understand how the other designers "help" each other and give each other advice. She mainly dissed my girl Kara and Kenley's friendship... perhaps she was jealous? Eh, she quips, "It's a competition, after all." Thank you, Mila. We didn't know this was a competition. At the end of the day, each designer is responsible for what they put on the runway and if I were in that situation, I would try to make friends with people too. Geesh, I don't even like Kenley that much but I am happy that she has Austin now that Kara is gone. Mila is wretched and Mondo seems to like her, which I don't understand. So the designers toil away. Michael's design makes me (and everyone else) think "pageant" dress. Jerrel embraces India in a very traditional manner. Mondo showed a slinky black number. Austin had trouble with his fabric choices and draping. Kenley did something very Kenley... and Mila, sweet Mila, presented a half short/half long dress that has the colors of the flag but nothing to do with that nation. She has some BS explanation she kept hocking the whole episode about freedom or something. I didn't buy it and neither did the judges. It was fugly and everyone knew it. Isn't it funny Mila? It wasn't important for you to make any lasting friendships or be helpful to other designers sooooo no one told you that your design was pretty sucky. It is a competition after all. She got booted and I smiled. Mondo won this episode and I am feeling that they are getting us ready for his triumphant overall win, making up for Gretchen winning his season. I still hold out hope for Austin though as he is my boo.